I was introduced to Pam Powers by way of my other favorite client, Susan Holding from the Little French Bakery. I was in the middle of a move and recovering from my first and only (knock-on-wood) Client from Hell experience, but Susan insisted that I would love working with Pam and that it would be a perfect fit. She was right. Not only is Pam a ridiculously talented knitwear designer, she's witty, cool, funny as hell, a brilliant photographer and a sister night-owl to boot. I'm thinking that this entry should have been titled, "An Ode to Pam Powers"
Working with Pam was dream. You know the client that trusts you to figure it out because that is why they hired you in the first place? Pam. The client that gives you space and encouragement while you work through the crappy ideas? Pam. The client with impeccable taste that not only knows exactly what she wants, but can expertly communicate exactly what she wants as well?....what?!! Pam. The project was a true collaboration, and I'm so grateful for the opportunity to have played a role in the creation of her new branding. Hope this serves as a bit of encouragement to my fellow freelancers; perfect clients do exist! 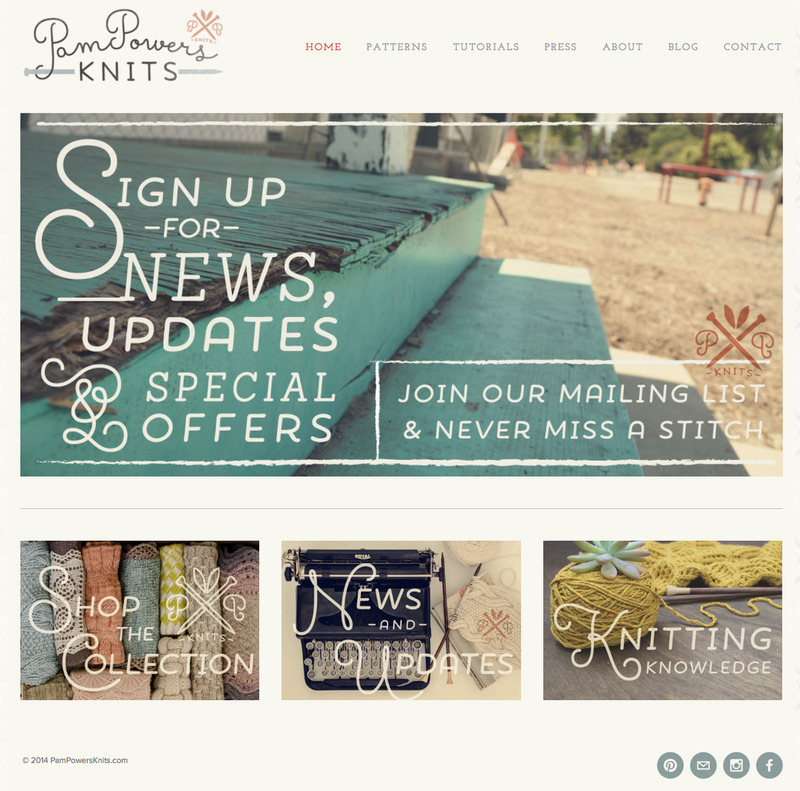 Here are few samples of the new Pam Powers Knits Branding (looking forward to showing you the packaging I'm putting together!) But you should really pop on over to her website and pick up a couple of of her beautiful patterns...think "Anthopologie for Knitters." Seriously great stuff. And for the knitting impaired (myself included) She has tutorials and patterns for beginners as well. After seeing her designs, I for one can't wait to finally try my hand at knitting this winter. And can we just talk about Pam Power's Photography for a moment? It certainly doesn't hurt when your dream client suddenly provides you with swoon worthy photography. Isn't it fantastic? In retrospect, it wasn't until Pam began uploading her photos to our shared folder, that the branding really started to come together.